First of all I must stress how painful it was to light my teeny tiny Diptyque Tubereuse candle - it really is the cutest little thing ever but the scent was just so tempting that I couldn't leave it be. Sometimes the best things come in small packages. 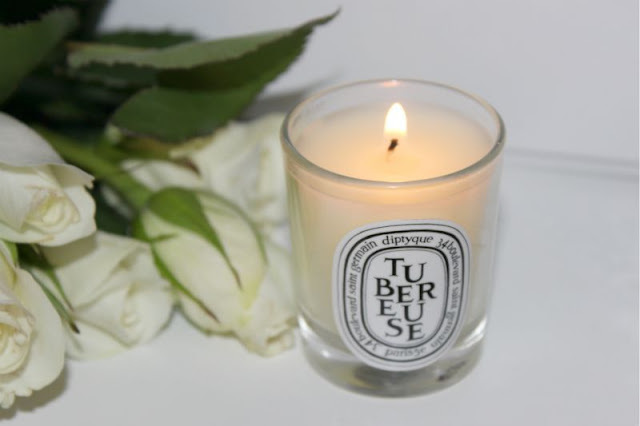 "Surround yourself with the lush, sensual and generous scent of Tubereuse. No flower is more beguiling – or more prized. The most expensive floral perfume ingredient in the world, its heady and intoxicating fragrance is completely captivating, making it one of the most cherished scents of all time. From the legendary French perfume house of Diptyque, this luxurious handmade scented candle creates an elegant ambiance in any home." Typically speaking I am not one for floral scents I prefer fruity, sweet or earthen fragrances but Diptyque Tubereuse is the expection. Yes it is floral but mild and not at all powdery, it exudes lady like luxury and oddly reminds me of Space.NK. I reckon they must have been burning this at one point when I was in browsing (a.k.a emptying my bank account) and it has registered somewhere deep in my brain. Tales of shopping aside despite being a tiny little candle let me tell you this baby can pack a punch - an hour of burning turned my little cottage flat into a flora oasis. If this size can do that I can only imagine what the full size is capable of. * PR sample from a gift bag. This sounds gorgeous! I've always wanted to get a Diptyque candles but never had a chance to have a sniff of any of them. I had a wee giggle at the small package comment.. Immature? Me?... This sounds great, I love Feu de Bois though so I find it hard to buy any others! Oh wow sounds fab, I'm not usually a fan of floral candles but this sounds gorge. I love floral scents. And this combined with a candle is an awesome combination. I'd love to check it out. Thanks for the review. I love tuberose but baies will always be my favourite diptyque candle! I have a whiff of this in Space NK. Absolutely in love! Check out my blog if your interested in making your own candles and tarts which will smell just as good as this!